Aardvarks (also called antbears) are strange looking animals with rabbitlike ears and a tail that reminds you of a kangaroo tail. 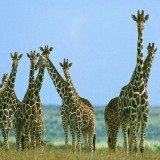 These African animals get their food in a very unique way. How do aardvarks eat ants and termites? 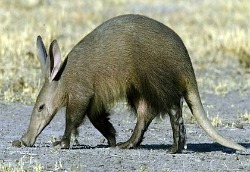 The Aardvark searches for insect prey by making shallow, exploratory scrapes in the soil surface with their front claws. What do aardvarks mainly eat? Any ant or termite nests it finds are dug open to expose their tunnels. The long, cylindrical, ribbon-like tongue and its coat of sticky saliva is then inserted into the tunnels of the nests. It then eats the insects sticking to its tongue. How are they equipped to be such burrowing specialist? Powerful front legs and massive claws have equipped these African animals with an enormous capacity for digging. This African animal will dig itself temporary refuge burrows, which it uses for a few days at a time. It seems to remember the location of these burrows and returns to them if danger threatens. Once inside the burrow the aardvark blocks the tunnel with a pile of soil. Antbears have earned the reputation of being the most prolific diggers of all African mammals. They can dig a meter of a tunnel in five minutes. Main burrows which are used as permanent homes can be deep and extensive and have several entrances. The tunnels and chambers of these large burrows are added to and modified continually. This is also the place where females will give birth. These burrows can have a number of successive occupants. These burrows eventually result in huge underground systems penetrating as deep as 6 meters below the surface. Are these burrows used by other African animals? Aardvark holes provide shelter for at least 17 mammal species. 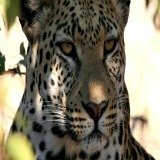 The burrows provide refuges and shelters for carnivores of several sizes including hyenas and leopards. They are also used by herbivores up to the size of steenbok and warthogs. Why do they have those long noses? Antbears uses that elongated snout for a keen sense of smell to detect underground ants' nests. Its tubular ears allows for hearing that is acute. Their eyesight is however very poor. They can dig fast to elude enemies. Antbears can also strike with their claws by flipping onto their backs to lash out with all fours. How soon does an aardvark cub become independent? Young cub can be seen moving around with their mothers as early as two weeks after birth. They first eat solid food at 14 weeks. They start digging for their own food when they are about six months old. They will often remain with the mother until the next mating season. Why do they swing their heads from side to side? If you do spot an antbear in the bush you will notice how it swing its long nose from side to side moving in a zigzag fashion. They do this to pick up the scent of ants and termites. Their main habitat requirement is a good supply of ant and termites. 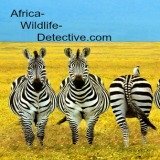 These African animals are nocturnal and very solitary. They are widely distributed throughout Southern Africa and prefer grasslands and open woodlands. They require sandy soil, as opposed to rocks, so that they can dig for termites and ants. Antbears are difficult to spot because they only emerge from their burrow late at night. They travel long distances of up to 15 km a night foraging at a leisurely pace over a considerable home range. They will come out occasionally during the day to sun themselves. 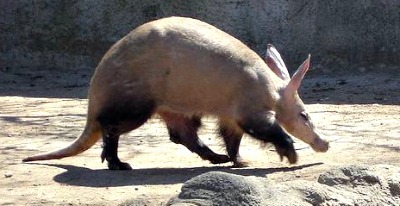 Because it has very poor eyesight, the aardvark is cautious upon leaving its burrow. It will stand there motionless at the entrance for several minutes listening for sounds of potential predators. 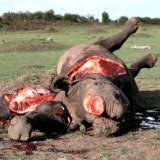 Their meat is tasty and very popular for human food with several African tribes. Body parts are also used for traditional charms and medicines like the teeth, which are believed to prevent illness. They are unpopular on farms where their tunnels are a problem for roads and dams.